The breakfast burrito, sometimes referred to as a breakfast wrap outside of the American Southwest, is a variety of American breakfast composed of breakfast items wrapped inside a flour tortilla burrito. This style was invented and popularized in several regional American cuisines, most notably originating in New Mexican cuisine, and expanding beyond Southwestern cuisine and neighboring Tex-Mex. Southwestern breakfast burritos may include scrambled eggs, potatoes, onions, chorizo, or bacon. Eggs, potatoes, wrapped in a tortilla. Bacon, sausage, meat, onions, etc. In the state of New Mexico, instead of other peppers or chorizo, it has red and/or green New Mexico chile. Some fast food restaurants such as Burger King, Dunkin' Donuts, McDonald's and Taco Bell sell breakfast burritos. The breakfast burrito is also a street food. The breakfast burrito was invented in Santa Fe, New Mexico. Tia Sophia's, a Mexican café in Santa Fe, claims to have invented the original breakfast burrito in 1975, filling a rolled tortilla with bacon and potatoes, served wet (or "smothered") with chile and cheese. Fast food giant McDonald's introduced their version in the late 1980s, and by the 1990s, more fast food restaurants caught on to the style, with Sonic Drive-In, Hardee's, and Carl's Jr. offering breakfast burritos on their menus. In 2014, Taco Bell launched their breakfast menu, which included breakfast burritos. 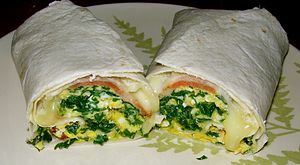 The breakfast burrito can be prepared with a myriad of filling ingredients, such as eggs, ham, cheese, onion, peppers, bacon, Canadian bacon, potatoes, sausage, avocado, tomato, spinach, beans, olives and other ingredients. The breakfast roll of Ireland is similar. ^ a b Burrell, Jackie (April 4, 2016). "Behold the best breakfast burrito ever". San Jose Mercury News. Retrieved May 23, 2016. ^ "Burger King is bringing out a new weapon to beat McDonald's and Taco Bell in the fast-food breakfast battles". Business Insider. May 3, 2016. Retrieved May 23, 2016. ^ "McDonald's breakfast items ranked by healthiness". San Jose Mercury News. May 13, 2016. Retrieved May 23, 2016. ^ Schouten, Lucy (March 10, 2016). "Taco Bell's $1 breakfast burrito: The latest skirmish in the 'breakfast wars'?". The Christian Science Monitor. Retrieved May 23, 2016. ^ Bellomo, Rheanna O'Neil (February 29, 2016). "Dunkin' Donuts Just Jumped Into the Breakfast Burrito Game". Delish. Retrieved May 23, 2016. ^ The World's Best Street Food: Where to Find It and How to Make It. Lonely Planet Publications. 2012. p. pt29. ISBN 978-1-74321-664-4. Retrieved May 23, 2016. ^ a b Emina, S.; Eggs, M. (2013). The Breakfast Bible. Bloomsbury Publishing. p. 110. ISBN 978-1-4088-3990-4. Retrieved May 23, 2016. ^ "Burritoville: Breakfast-burrito highlights". The Santa Fe New Mexican. April 29, 2016. Retrieved May 23, 2016. ^ Anderson, Judith (1998-05-24). "What's Doing In; Santa Fe". The New York Times. Retrieved 18 August 2007. ^ Michman, Ronald D.; Greco, Alan James (1995). Retailing Triumphs and Blunders: Victims of Competition in the New Age of Marketing Management. Greenwood Publishing Group. p. 182. ISBN 9780899308692. Retrieved 18 June 2013. ^ Andrew F. Smith (2 December 2011). Fast Food and Junk Food: An Encyclopedia of What We Love to Eat [2 volumes]: An Encyclopedia of What We Love to Eat. ABC-CLIO. p. 72. ISBN 978-0-313-39394-5. Andrew F. Smith (28 October 2013). Food and Drink in American History: A "Full Course" Encyclopedia [3 Volumes]: A "Full Course" Encyclopedia. ABC-CLIO. p. 119. ISBN 978-1-61069-233-5. ^ Luna, Nancy (26 March 2014). "Taco Bell breakfast: 8 must-know details, plus early waffle taco reviews". OC Register. Retrieved 4 April 2015. ^ Lisk, M. (2009). The Burrito Diet. Al Lavallis Enterprises. p. pt104. ISBN 978-0-557-10069-9. Retrieved May 23, 2016. ^ McDonald, Brian (2008-05-12). "Top breakfast baguette rolls into Irish history". Irish Independent. Retrieved 2019-02-03.